The following table, which is based on official data from the National System of Information and Market Integration SNIIM of the Ministry of Economy, presents a comparison of lime prices between November and December. 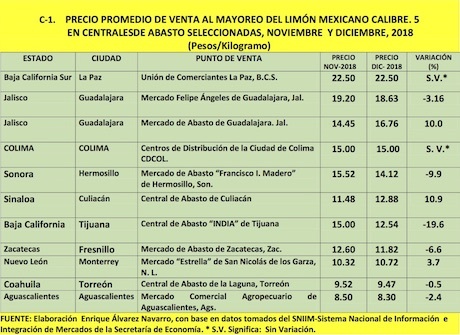 The highest price was 22.50 pesos per kilogram, which was registered in December in the Wholesale market of la Paz, BCS, and the price didn't present a variation over November. It was followed by the Felipe Angeles wholesale market from the city of Guadalajara, Jal., with 18.63 and 19.20 respectively, i.e. a variation of -3.2 percent. Meanwhile, in Guadalajara's wholesale market, Jal., prices presented a 10 percent variation, as they went from 14.41 to 16.76. It should be noted that these 3 wholesale centers handle the first quality, 5-caliber fruit; however, the prices at the Distributor Centers of Ciudad Colima CDCOL, which handle fruit in bulk and without classification, stood at 15.00 pesos per kilogram in the aforementioned two-month period and did not present a percentage variation. 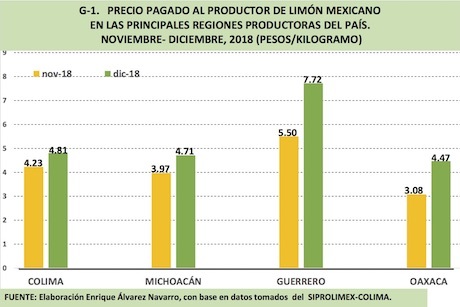 The prices at the INDIA wholesale market of the City of Tijuana, BC, stood at 15.00 and 12.54 pesos per kilogram in November and December, respectively, and presented a variation of -19.6 percent. In the Estrella Market of San Nicolas de la Garza, Nuevo Leon, prices stood at 10.32 and 10.72, presenting an increase of 3.7 percent.